We used to provide a list of free Google proxy servers on google-proxy.net and update it daily. But Google blocks all the public proxies in the year 2016. So there is no google proxy server (IP address and port) on that page anymore. A Google proxy (also know as the google-passed proxy) is an HTTP proxy which has the following two features. 1. It must support searching on Google. Proxies in China cannot access Google. So they are not Google proxy. Since Google uses HTTPS instead of HTTP as its primary protocol, a Google proxy should support HTTPS/SSL. 2. Google must not block it. To stop abuse, Google blocks suspect IP addresses which have unusual traffic. A Google proxy should not be on the blacklist of Google. Many SEO (Search Engine Optimization) programs such as Scrapebox make a significant number of queries on Google to get information such as ranks and competitors. If you use them, you should use a Google proxy to avoid being banned by Google. Some countries (such as China) block Google. You need a Google proxy to access it. Google shows a page to verify that you are a human instead of the robot if a proxy is detected. 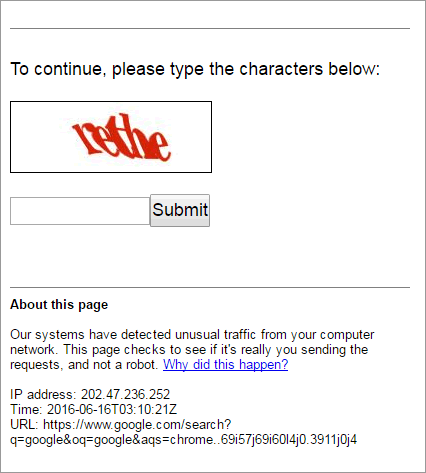 Before the year 2016, Google allows using that proxy for some time if you can pass this human verification. But Google changed that rule in 2016. Now a verification is required for every search as long as you are using a public proxy. It makes the public proxies useless for Google searches. This image shows that Google blocks all the public proxies. In the Google proxy checker program, Elite Proxy Switcher, “Partial” means you need to pass a verification before every search on Google. Update: The new version (1.29) of Elite Proxy Switcher removed the function to check whether a proxy supports searching on Google. It’s because none of them support it. Google proxies are all dead. How to Unblock Google Now? All the public proxies cannot be used on Google now. However, you can use private (paid) proxies. If you need to search Google by programs (with a large number of queries) such as Scrapebox, you can buy private proxies. Then import their IP addresses and ports into Scrapebox. If you use Google manually (properly), you can use a hide-IP program such as My IP Hide. It’s much easier to use.